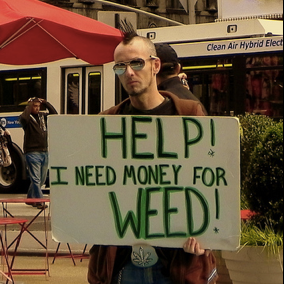 Things got particularly weird in Times Square on Friday night, when a panhandler known as Weed Man (he carries a sign reading “Help! I need money for weed”) got into a fight with a guy who will now be known as Beer Man (his sign says simply “I need beer”). The New York Daily News reports that Weed Man (whose given name is Justin Joshua Long) stabbed Beer Man (a.k.a. Wayne Semancik) with a pen after the two got into a turf dispute on 42nd Street, near 7th Avenue. Beer Man told NY1 that things got ugly after his rival spat at him. “When you spit in my face, darling, I’m going to hit you. I don’t care who you are, how big you are, I’m going to hit you,” he said. “So the man, he pulled out a pen because I was hitting him, and he started stabbing me in the face, and I have five stab wounds in my face right now.” Weed Man was arrested, and Beer Man was treated for minor injuries. According to the Daily News, two people wearing Alien and Predator masks witnessed the incident and gave statements to the police afterward. (Yes, there’s a photo.) Only in New York — and in the dreams of intoxicated teenagers.